GAP: Crowdsourcing? Or Damage Control? Let’s get one thing straight from the start. Spec work is bad. Sometimes it’s a necessary gamble – a way of flexing the creative muscle in a sort of impromptu creative bodybuilding show. But any self-respecting agency strives to keep the amount of spec to an absolute minimum. This entry is not about spec work. It’s about how spec work and crowdsourcing should not be the same thing. Speculative work is about voluntary participation in the hopes of getting paid. 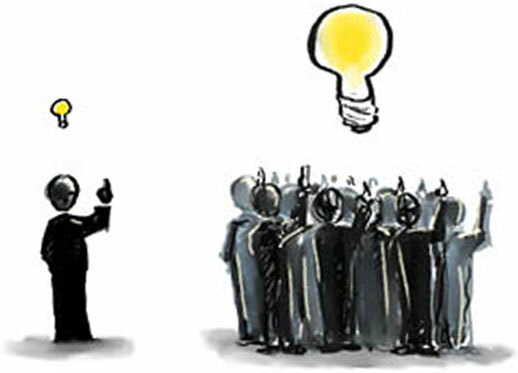 Crowdsourcing should be about voluntary participation for the sake of participating. Spec work is singularly driven. It’s about one person or agency vying against another in the hopes that the better work will prevail. Crowdsourcing should be community driven – it should empower your audience to be vocal about what they love about your brand. And, hey, who doesn’t want to contribute? Spec work is about the final product. Crowdsourcing should be about the process itself. The real world appears to have happened somewhere between those two scenarios. While GAP might well be planning a crowdsourcing campaign that tramples my idealistic construct and ultimately boils down to spec work, that hasn’t happened yet. Here is what has happened: GAP released a logo everyone hated. At first, people started talking. Then, people starting saying they could do better and began offering up solutions. GAP commented on their Facebook page that they happened to like their new version, but that they appreciate the “passion” of their fans and asked us all in the Great Big Dialogue out here to keep an eye out for details on a “crowdsourcing” project. What that says to me is that GAP paid for a logo they thought was great. Everyone else despised it so much that new logos started popping up in a process akin to natural selection a.k.a. crowdsourcing. Rather than let it become a PR incident of epic proportions, GAP seized the opportunity, (using social media of course), and turned it into a buzzworthy event of epic proportions. So… all you folks out there hating on GAP for abusing all the poor, homeless designers of the world, stop… count to ten and take a really close look at where the call to action really came from. Did it come from the company or the crowd itself?